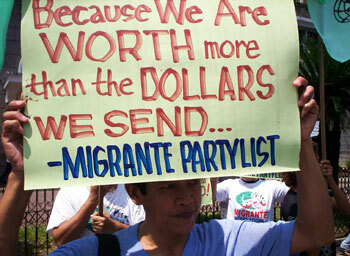 Migrante Sectoral Partylist slammed the Department of Budget and Management (DBM) for deleting the P89.6-million budget initially penned in the proposed 2015 budget for the implementation of overseas absentee voting (OAV). During the budget hearings at the House of Representatives, the Commission on Elections (Comelec) expressed dismay over the DBM’s scrapping of the proposed budget for OAV registration in the 2015 National Expenditure Program (NEP). According to Connie Bragas-Regalado, Migrante Partylist chairperson, since 2010, the government has not allotted a single additional centavo for the implementation of the OAV. The budget for the OAV remained at Php43.4 million since fiscal year 2010. “2015 is a crucial year for OAV registration for the upcoming 2015 elections. How can the government expect to reach as many overseas absentee voters with this meager budget? What will it cover? Is it enough for voter-education and additional personnel?” said Bragas-Regalado.